Engine steam cleaner reviews on this page are of those steam cleaners that have been manufactured with the capability to also steam your car engine, and any engine for that matter that might might need steam cleaning. Engine steam cleaning is favoured by some car onwers over pressure washing for example due to the very difficult to remove engine grease , oil and grime. Removing accumulated engine oil and grease helps your car engine to look smart and well kempt. Above all, it is also an important precaution aganist your heated engine starting a dangerous fire. As you look to find an engine steam cleaner suitable for your purposes, it is importamt to remember that not all engines are recommended to be steam cleaned by car onwers at home. Most cars today have a lot of sensors and electronics that can easily be damaged if steamed or exposed to moisture. This means proper insulation of sensitive areas has to be done or the vehice has altogether to be sent to an engine steam cleaning specialist. Another important point to remember in your research for a suitable engine steam cleaner is that steamers with a very high steam temperature are the most suitable. These release less moisture content in the steam. In fact here at PressureWasher SteamCleaner we recommend the use of a dry vapor steamer such as the Ladybug steamer or Vapamore steamer. Vapor steam cleaners produce very hot steam which is essentially vapor. This leaves your engine clean yet dry. You will need a wiping cloth at hand to wipe off melted grease and oil once the vapor has passed over the dirty surface on your engine. The following are some high wattage steam cleaners that you may consider for your engine steaming. Generally, high wattage steam cleaners produces steam which is extremely hot and with less mostuire content. You will also require some protective clothing to preveny getting burnt by hot steam. We particulary like this steamer due to its high wattage. Right away we can count on having little or no water spitting out as the steam is produced. At a very high wattage of 1500w this steamer when working as designed should give you very hot steam which does a dry engine cleaning effectively. It is also to use around your garage and car with a carrying shoulder strap. You can strap it to your shoulder as you steam clean your engine. This ensures that there is no potentially dangerous contact between your steamer and the engine itself. The model has a 33-ounce water tank that can supply you with a good 50 minutes of continous steaming. The accompanying two extension wands also particulary help you reach the most difficult areas on your engine including underneath the car. A tip here that most people are not aware of is that whenever you want to mantain a high temperature steam output, it is important to keep the steamer attachment short. In as much as it is beneficial, adding extensions will lengthen the distance the steam has to travel therefore giving it an opportunity at worst to turn into water drops along the way. This steam cleaner for your engine also comes with a steam jet nozzle attachment. For all steam cleaning the jet nozzle attachment is effective in releasing concentrated and targeted very hot steam which can remove the toughest of engine grease and grime. 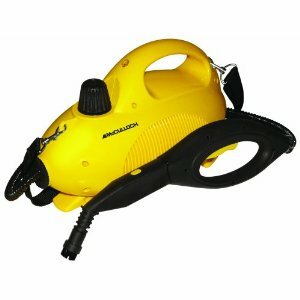 The good news is that the McCulloch MC1246 portable steamer can also be used for other cleaning projects around the home such as your upholstery even in the car, carperting, BBQ grills, oven, tile grout, bathrooms, kitchen and so on. Other engines you can use this steam cleaner on include generators, boat engines and workshop engines. We recommend this engine steamer as a good buy particulary for your engine. Expect to find it for about $70.00 on Amazon often with free shipping. Follow this link to read reviews of McCulloch steam cleaners in general. The SteamMax SF-275 is a highly rated steam cleaner available on most online stores. It is a home steam cleaner which is designed to do your regular home interior cloeaning projects as well as outdoors in your garage and specifically your car engine. It is similar to the foregoing McCulloch MC1246 reviewed above it terms of wattage. This steammax also has a wattage of 1500w. It is a very hot steam cleaner which will be able to lossen and dry clean any grease and oil found in your workshop and engines. If your concern is how long steam lasts, this model from Steamfast will give you up to 1 hour of continous steaming compared to the 50 minutes offered by the McCulloch engine steamer above. This is because it has a bigger 50-ounce water tank unlike the 33-ounce of the McCulloch Mc1246. This steamfast steam cleaner produces pressurized steam the very thing you need to blow away grease and dirt from your engines. 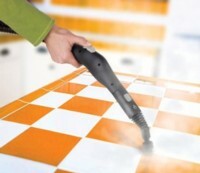 A pressurised steam cleaner produces better results than an ordinary steam cleaner. It cleans with no chemicals and your ordinary home tape water will do the job provided its not hard water. If you have hard water you will need to use distilled water which is free of compouds which can harm your steamer. The variety of attachments that comes with this steamer also makes your engine cleaning job a pleasure. For example, it has a long nylon brush which you will find handy in reaching the hard-to-reach areas of your engine. You also have a scrab pad used to scrab off tough grease whilst steaming. As mentioned this steamer will also be effective in cleaning jobs inside the house such as your sinks, grill, bathroom, upholstery, grout and so on. You may read more about the cleaning jobs this model can do inside the house by following the link to steamfast steamer reviews. This is also a 1500w steamer. Ladybug steam cleaners are well known to be very effective, highly quality as well as pricey steamers. They are long lasting and are often used for commercial purposes. Selling for about $1500.00 each these steamers are beyond many people's consideration. However, they are very good engine cleaners better known as vapor steamers. They produce high temperature dry vapor steam which is ideal for cleaning engines that have sensitive components that can get affected by water or moisture. You are likely to find ladybug steamers at your professional engine cleaner. Alternatively, in order to use one on your car if you are not prepared to invest in one, you might consider hiring one for your once in a while engine steaming. However, with a wide fleet of cars to steam, in the long run it is cheaper to invest in ladybug steam cleaner. One key function that sets apart ladybug steamers from teh rest including those reviewed above is the continous fill function. This means you can refill the tank without ever waiting for a cool down. Moreover, the TANCS technology produces better cleaning results on surfaces cleaned. Thank You For Visiting Come Again Soon! Are you looking for something eco-friendly? Most modern steam cleaners are eco-friendly using just water to clean and sinitize your home. They can also remove those annoying wall-papers. When using a power washer like the one above or any other washer for that matter, ensure to drain all the water out before a winter freeze. Copyright © 2011. All rights reserved. All images are the copyright of their respective owners..